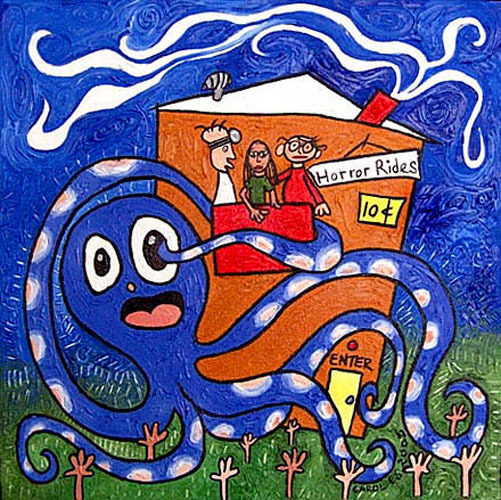 I have other paintings that happen to be scenes from recurring dreams. 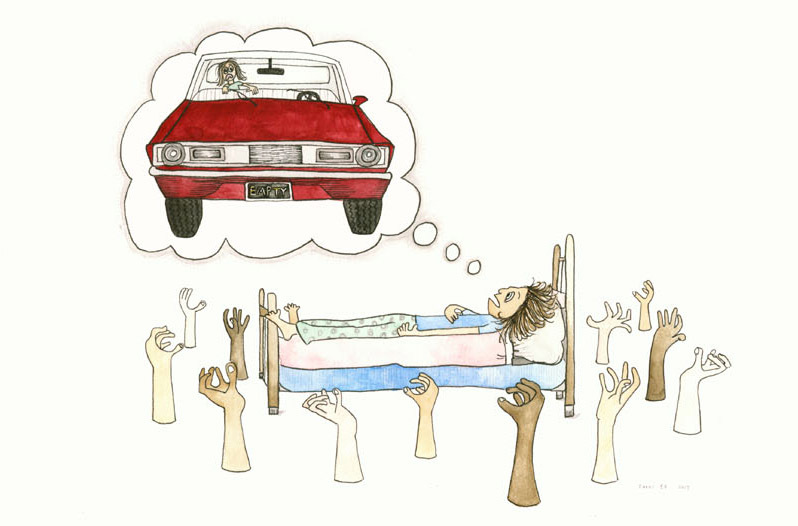 This one also has the hands in it, but features the nightmares I had about waking up in the back seat of my dad’s car. It would be zooming down the street, but no one was driving the car! I was all alone, freaking out, waiting for the car to crash. I still have awful dreams. I try to avoid sleeping all together, and don’t get much REM sleep. I wake up a couple hours after I go to bed, walk around, and try to go back to sleep. But honestly, I am a sleep fighter. An insomniac. I sleep throughout the day while I work and am awake. My thoughts get jumbled while I’m typing, painting, or reading. Sometimes I will confuse my jumbled dream states with reality. It’s really not good. This has been going on for about three years now, or at least I am noticing that I’ve been sleep walking through my waking hours for the last three years. I believe it’s partially the reason why it took so long to write my book. I know it’s why I avoid driving. Lately, I’ve been good to myself and have been laying down and napping during the day when I feel wasted. I didn’t used to do that. Now I don’t think I have a choice. So I’m going in for a second sleep study. Maybe I’ll get some answers. Maybe I’ll get some help. We’ll see. I did have Holly Jerger, the curator from the Craft and Folk Art Museum over here a few weeks back. I didn’t mention it because we didn’t exactly talk about anything definite. It was still a good visit though. She was interested in my Journal Project and Specimens for a future show. Still no action on the art-making front though, but lots of movement on the book biz. One little hiccup is that there’s been a delay on getting the book back from my proofreader/copy editor. It puts a slight kink in the schedule, especially because of Christmas, but that’s just how these things go. Otherwise, the timeline is all set for the April 6th release date (February 1st Pre-sale). In about a week from now, I should be putting in the order for the advance copies. That means I should have them in hand a little after New Years, if it’s not too backed up. I made some time allowances for unforeseen holdups like this. Not a lot, but some. I kind of have to figure on a month over the holidays in place of their usual three-week (business days) turn-around. That should give me enough time to send them out for reviews and check everything one last time and put in a hardcover order. Now I’m thinking about things like the special edition hardcover and the trailer . Meanwhile, I’ll continue to read, read, read. I am still studying everything there is to learn about metadata. That might be one of the reasons I don’t blog as much as I’d like to; what I’ve been up to is boring! I’m still deciding what the special edition of the book is going to be — if I’m going to go “all out” or not. I may just do a lettered hardcover edition that comes with an original painting inside, signed and numbered of course. It’s either that, or I can have them rebound with letterpress covers and go that way, maybe even do a smaller edition and charge more, but I’m leaning toward my first thought. Either way, I must get started on my trailer if it’s going to be the way I pictured it. Of course it can’t be exactly how I envisioned because I’m not that talented of a filmmaker, but I think I can fake it and get the message across good enough. I know I can do good audio and that’s almost half of it. Okay, don’t forget to eat your peas and carrots. Bye for now.